Nebraska may not be famous for mountainous slopes, but its gently rolling terrain is perfect for casual cross-country skiing during the winter months. And the best part is you won’t have to fight long lines and big crowds to hit the snow and have a great time. Here are the 10 best cross-country skiing trails in Nebraska. Elmwood Park in Omaha, Nebraska, is one of the best cross-country skiing trails in the city. Large, flat, and tree-lined hills make it a favorite for lovers of the sport. This two and a half-mile looped trail is a rugged option that will test your skills. The area doesn’t see a lot of traffic, so it’s a great place to enjoy a more primitive experience with nature. Pioneers Park to the perfect place to enjoy a relaxing afternoon skiing on easily marked and groomed trails. Skiers will enjoy casual descents through meadows and pines. Close to many of Omaha’s universities and business districts, the Keystone Trail is open year-round for cross country skiing along the Missouri River. Many portions of the seven miles of hiking trails within Mahoney State Park are groomed in the winter for cross-country skiers and open throughout the season. Big Papio Trail is a quick drive from Omaha. The area offers scenic views as well as wide open areas and is open year-round for cross-country skiing enthusiasts to enjoy. Located near the Keystone Trail, the Bellevue Trail loops around the southern edge of the Omaha suburb, Bellevue, with beautiful river views. Kearney is home to historically significant portions of the Oregon and Mormon Trails once traveled by pioneers. Today, skiers can take a journey across the Kearney Trail and experience all its neighborhoods and historical sites along the way. 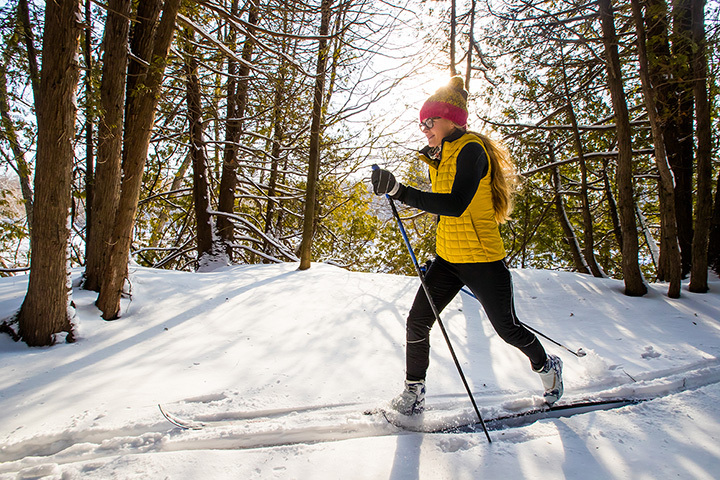 As the largest city park in Lincoln, Wilderness Park features an expansive network of trails perfect for cross-country skiing activities during the winter months. The trails are moderately trafficked and feature a river to enjoy. This 850-acre tallgrass prairie nature preserve transforms into a cross country skier’s paradise when the snow falls. Visitors can experience nature and check out a historic 19-century wagon from the Oregon Trail. View more Nebraska Cross Country Skiing Trails.